Renderings for a mixed-use two, double tower complex are available on the SLCE Architect’s website showing a high rise community for what is currently the low-rise Avalon Cove. Two renderings indicate a 6 to 8 story base with high rise towers; retail is shown in the base of the building. Included in the rendering is “Whole Foods Market” signage. While rumors of Whole Foods imminent arrival in downtown Jersey City have circulated more or less since the beginning of the internet, the use of the sign in the render is probably just for the purpose of the mock up, and its unlikely that this is a confirmation of the arrival of the much beloved grocery store. 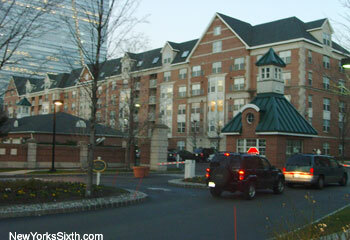 The existing low-rise rental buildings are Avalon Cove consist of 504 units secluded in a gated community along Washington Boulevard and borders the Hudson River. The two block long complex is not integrated into the urban fabric, segregated by a large fence and tall shrubs. The low-rise Avalon Cove was completed in 1999.